Go to sipper Smooth, full of flavor and nice texture! A great sipping rum and well worth the price. Nice Full of flavor and smooth creamy texture. 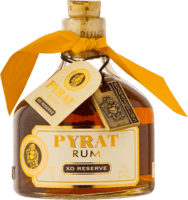 Great sipping rum! Love this rum! Smooth, sweet and a great nose. A little vanilla and fruit, with a touch of leather and wood. Perfect neat. Excellent sipper! This is a great rum to enjoy neat. Lots of sweet nose and a great caramel texture. Smooth, great nose Beautiful color, sweet and vanilla. The blending and aging process are a little suspect to me, but it's definitely worth a try. Smooth, sippable Great sipper, smooth. This was good transition run from bourbon, given the oakiness. Good, light This a a good value rum. Plenty of flavor, hints of vanilla & leather. Light in texture and not as creamy as some similar priced rums. Good, but there are better While not my favorite sipper, it has its merits. Not as sweet as some I prefer, but enjoyable nonetheless. Citrusy, light This rum has a citrus element, little heavy for me. It's light and can be refreshing with a cube or two. It's okay Not terrible neat, but lately I've taken to mixing it with coke. The reg captain is good for that....so there are better options for a neat rum.